It's been a remarkable run for the Blues this season, going from a frustrating, underachieving group of talents to a cohesive unit capable of dominating the NHL. The turning point of the season, of course, came early on when team president John Davidson and GM Doug Armstrong made a coaching change, replacing organizational product Davis Payne with defensive mastermind Ken Hitchcock, who brought a Stanley Cup ring and a disciplined, suffocating style of play to town with him. 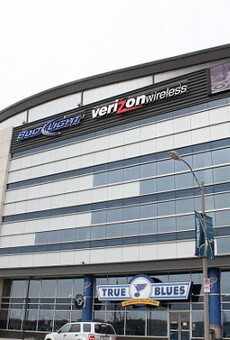 The Blues face off against the Phoenix Coyotes in their final home game of the regular season at 6:30 p.m. Friday, April 6, at the Scottrade Center (1401 Clark Avenue; 314-241-1888 or www.scottradecenter.com). They've been virtually unbeatable at home this year, setting a new franchise record for home wins in a single season. The Central Division crown has long since been locked up; the Note will largely be playing for pride and to provide a properly splashy sendoff to a magical season.